Al Jazeera America, the upcoming cable new network that will replace the Al Gore-founded Current TV, has created an online presence, although it has yet to find a physical home. While the site doesn’t include news headlines yet, it appears to be serving as more of a hub of information about the forthcoming channel, with a general introduction to the channel and some of the key players involved, including recently hired former CNN anchor Ali Velshi. Also included is the channel’s code of ethnics, as well as press resources and job postings. 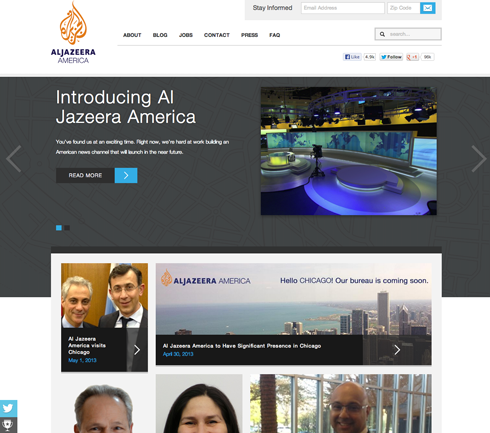 The website itself features a clean design that closely matches Al Jazeera’s other Web properties. The homepage featured tiled photos with headlines that can be clicked on for more details. One significant usability stumbling block the site has is that, in those tiled images, the arrow, which indicates additional content is available, isn’t clickable. To read the full post, you need to click the headline itself. The website could also benefit from some better imagery — Velshi’s photo appears to have been taken facing a wall of windows, causing him to be cloaked in shadows — and sorely needs color correcting. Other photos are of similar lower quality (or maybe Al Jazeera is trying to retain some of that folksy citizen journalism that was originally part of Current?). The photo of the Chicago skyline used to promote the channel’s Windy City presence is hazy and, perhaps more important, poorly cropped so that most of the important parts of the image are under the nearly solid black bar the overlays the photo. It’s also worth noting that the website is hosted at a subdomain of aljazeera.com, america.aljazeera.com. The domain aljazeeraamerica.com appears to be owned by a third party called the Middle East Forum and redirects to a blog post critical of the network.